Due to the hours-of-service regulations found in Part 395 of the Federal Motor Carrier Safety Regulations, commercial motor vehicle operators must keep detailed records of hours worked. This is accomplished by the use of either an electronic solution or the use of the Driver’s Daily Log form. Log forms can be produced in book form with a triad cover, loose sets that are drilled to fit into binders or spiral bound in books. 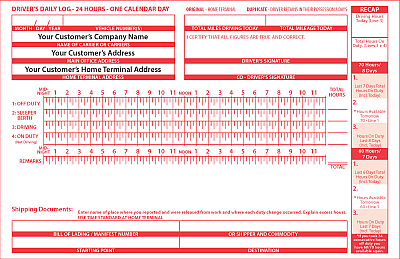 These are custom forms and we can add your customers information and print in a single color or let your customer information stand out with their name in a separate color. If your customer has a specific format in which they need their forms, talk with our customer service at 800.633.1228 to see if we can accommodate your customer’s specific requirements.